How are you set for tools for this gardening season? There are so many more tools now that in the past, both power and manual. Having the right tool for the right job, you’ll be amazed how much easier (on your body) and quicker your garden activities will get done. 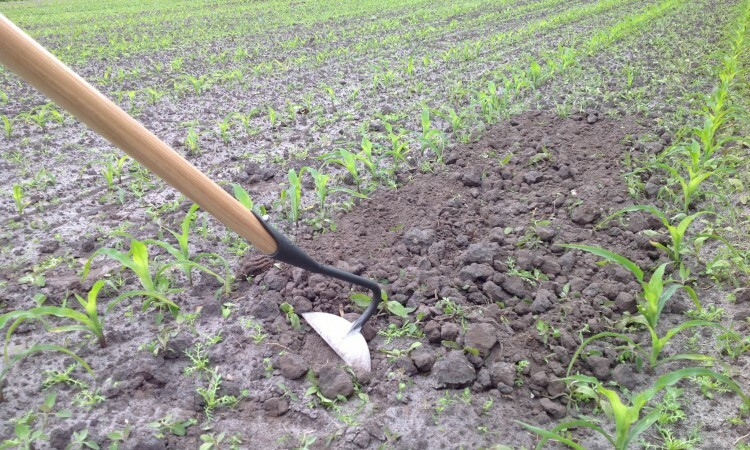 Here are a few of the common manual tools for digging and weeding, and their uses. To start, you will need something to dig with, such as a shovel or a spade. A shovel is built like a somewhat flattened scoop, generally with curved blade tip. It’s designed to move material from one place to another, or soil from a planting hole. The blade of a spade is flatter than a shovel, can be slightly curved, but generally has a squared off tip rather than a point. 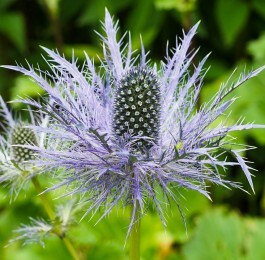 You use it to make straight border edges, or to divide perennials, for instance. With generally longer blade, spades are useful as a lever when digging large heavy rootballs of plants, or moving large rocks from the ground. Both spades and shovels you push into the soil with your foot and pull back on the handle, like a lever. A common mistake is to try and push these into the soil just with your arms. They have foot rests for a reason! Some have larger foot rests, making it easier to push them into the soil. Some have straight handles, others D-shaped, others curved ergonomically so easier to handle. Some are made of fiberglass, wood, or steel. Part of the choice in which to use depends on your strength (even a pound heavier tool, used repeatedly, can make you tired more quickly), and the job at hand. 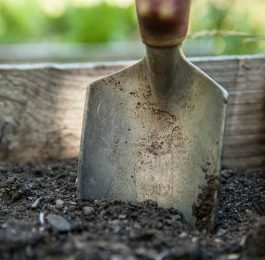 There are further variations in spades and shovels, such as ones with narrower blades for narrow holes or trenches perhaps, ones with small blades for digging and moving small plants, and ones for specific purposes such as planting and digging perennials. If you like to work close to the ground, look for ones with short handles. The hand trowel is the ultimate small shovel or spade, again coming in variations with smaller or wider blades. One type of shovel that I find useful is the scoop. Its blade is quite large and curved– useful for moving large quantities of lighter materials such as compost or shells of bird seeds under feeders. Think of it as a large dustpan with long handle, good for picking up small stones you’ve raked. You can get these in metal or plastic, with straight or D-shaped handle (I like the latter). Just make sure to get one for the uses you envision, and lightweight unless you’re in good physical shape. Another variation in tools for digging is the spading fork. It has flat tines—usually 4 to 6 of them– and is especially good for heavy clay soil, or turning garden soils, or loosening garden soils prior to planting or digging (such as digging up potatoes and bulbs). 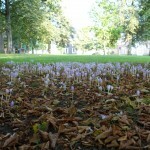 By digging underground, loosening the soil first, you lessen the risk of cutting into the plant roots or bulbs. Don’t confuse a spading fork with a pitchfork, the latter with curved, slender tines (usually 4 to 8 or so) and which is used to move straw, mulch or compost. Again there are variations for both forks in handle type and length, length and number or tines, and size of tines. A spading fork with short tines is sold as a perennial fork. Those with welded metal can be a bit lighter than ones made with forged (from one piece) steel, although the latter tend to be more attractive. So much force is exerted on spades, shovels, and forks that they need to be very strong if you want them to last. Look for ones with handles that will last, and particular good strong connections (such as a shaft) between the handle and blade. If you do lots of gardening, or tend to break handles, look for tools that have replaceable handles. Buy the best you can afford. The same applies to rakes. Look for extra reinforcement at the socket where the handle meets the business end. Cheap rakes have flimsy handles that will pull out of the sockets under heavy use. (I’ve had to reattach some in the past drilling holes and inserting screws.) One of my favorite tools is a collapsible rake, which can be adjusted to various widths. This is useful between plants in beds. On the other hand, look for one much wider with lots of wide tines for raking leaves. Or, look for one with short, fixed metal tines at a right angle to the handle (gravel rake) useful for raking stones in an unpaved driveway or from beds, removing clods and small stones from beds, and smoothing soils. As with the other tools there are many variations from cheaper plastic rakes to heavier steel ones, both in the rake part and the handle. Most rakes have straight handles, but some are lighter weight aluminum and curved to be more ergonomic—easier on your back (this is my favorite leaf rake). Hoes and cultivators have perhaps the most variations in the actual blade, which is usually metal. Some are welded metal, others a heavier forged steel. Hoe handles are usually straight (some can be curved as for ergonomic rakes). As with other straight handles, try and find one the right length for your height to minimize how much your back needs to twist while using the tool. Of course there are small hand versions, coming in many types of weeders. There are straight blades for weeding, long narrow ones for digging taproots as of dandelions, narrowed straight blades (grubbing hoes), and ones with metal tines for loosening soils to make weed pulling easier. There are hoes with flat blade tips for weeding, coming in all kinds of widths, and generally solid. Some of these you push and pull to weed, such as a narrow blade (the stirrup hoe resembling its namesake) useful for cutting weeds off at the surface or for dislodging small annual seedlings, a variation with narrow blade for the same purpose or smoothing soils (grading hoe), or one with a flat blade roughly in line with the handle (a scuffle hoe). There are hoes with sharp points, good for moving soil and making trenches for planting vegetables and seeds, or dislodging small plants. Since I tend to have large weeds when I get to them, my favorite cultivator has three large curved tines. There are many other tools besides those listed that you may find useful in the garden. These include other specialized ones for digging, such as post hole diggers; pruning tools; other weeding tools such as long-handled propane burners for weeds between patio stones and in brick walkways; tools for edging along walks and borders of beds; hand tools such as a hatchet or serrated blade (old saw perhaps) that are useful when dividing perennials; and many watering devices, handles, and nozzles. 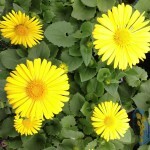 Check with your local garden supply store, online, mail order suppliers, and your gardening friends for more ideas.